Is my Jewish grandmother making me fat? Last night, D and I went to dinner with a dear family friend who is practically like a grandmother to me. She is probably one of the most vibrant women I know — at 87 she is full of life — she tap dances several times a week, does pilates, goes to work every day and attends plays, Broadway shows, and has a warm and caring family. Talk about having it all! As we were eating, she kept asking D “eat more! You must be hungry! Try some of this…are you full?” It was very cute, and even though D was stuffed from his huge steak, he managed to polish off some of her food too. But it got me to thinking, most of us do not have the freakish metabolism that D has (seriously it makes me SO jealous!) and can eat a steak that is the equivalent of small football field every night… so what do the rest of us do when we’re put in this kind of situation? I can’t even tell you how many times I’ve been at dinners or family events and had food pushed on me by family members. I don’t want to be rude…but I also don’t want to feel guilty about not cleaning my plate. It’s a delicate balance, but here are some good tips I’ve picked up along the way that quell even the pushiest of relatives! If you’re really full or you just don’t want to eat dessert, try just saying a firm “no”. Not only does this strengthen your own willpower but often a simply no or a “you know what, this meal was so delicious I don’t think I possibly have any more room!” Let them down nicely, but make sure that the “No” is heard. Sometimes a simple “no” doesn’t work. Example: “How can you not want dessert? Look at you…you are so skinny! 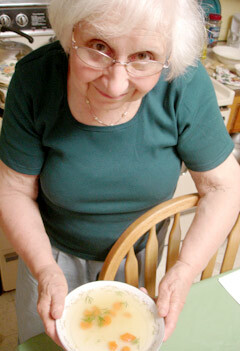 Eat something!” Let’s face it, a lot of grandparents/relatives/parents get enjoyment out of nourishing their kids. It comes from a place of love, but sometimes it can be really hard to face, especially when you’re watching what you’re eating and trying to be healthy. In these instances, it’s best to just be honest. Say to grandma “You know what, that dessert looks truly amazing, but I’m really trying to watch what I’m eating these days, so I’ll have to pass.” Or ask for just a sliver if you’re in the mood or some fruit or tea instead. A lot of times when I go home, my mom will ask me what food I want to have in the house or want to have for dinner. I think this is really great because she knows that I’m pretty health conscious (and picky!) so it makes me really feel at home and cared for. But you don’t need an invitation to do this. Offer to bring a healthy dish with you such as salad or a light dessert. Not only does it make your host feel appreciative of your efforts — you can bring something that you know is healthy as part of the meal. A lot of times, especially around the holidays, I feel like every family get together is all about the food (as in, let’s all stuff our faces until we have to unbuckle our jeans). Try to switch things up a bit…suggest a game of football in the park, go for a walk around town, grab a coffee, play frisbee, go for a long bike ride. These are all fun activities you can do with your family that aren’t centered around food and are great bonding opportunities. This is a tough one…but you should never feel guilty for not cleaning your plate. If you’re full you’re full. Starving children in Africa would not be able to eat your food anyways — it’s already been made – it’s not like you can ship it over or something! You do yourself a disservice by not listening to your body and your needs. You are taking care of yourself by realizing when you’re full and doing something about it! Even the pushiest grandma can’t argue with that! Great post, S! I’ll keep these tips in mind when I become a Jewish grandmother!! This is my grandmother to a T. And I’m not even Jewish!